NEW YORK, April 16, 2019 /PRNewswire/ -- Shutterstock, Inc. (NYSE: SSTK), a leading global technology company offering high-quality content, tools and services through its creative platform, today announced the launch of its first Augmented Reality (AR)feature, available on the Shutterstock customer iOS application. The latest update to the iOS application includes a new "View in Room" button that allows users to access their camera phone and virtually position any of Shutterstock's 250 million images against the wall in a room of their choosing. 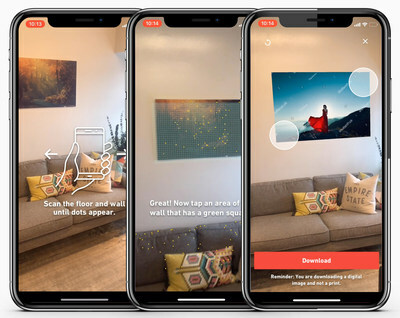 Shutterstock's in-house mobile team leveraged the iOS ARKit framework to create this virtual reality experience, enabling customers to interact with the expansive Shutterstock collection in a whole new way. Shutterstock customers are increasingly using the collection in the form of in-home, in-store or in-office artwork, for retail spaces or for restaurant decor. Now, rather than imagining how a new image would look hanging on their wall, they can bring their imagination one step closer to reality by simply using the Shutterstock app to position an image virtually in a room before licensing. The "View in Room" tool is available on the Shutterstock Customer iPhone application in the app storetoday. Shutterstock has offices around the world and customers in more than 150 countries. The company's brands also include Bigstock, a value-oriented stock media offering; Shutterstock Custom, a custom content creation platform; Offset, a high-end image collection; PremiumBeat a curated royalty-free music library; and Rex Features, a premier source of editorial images for the world's media.